The History of Class 107 Ltd. The purchase of Driving Motor Brake Second 51993 together with 52012 was agreed from the Caledonian Railway at Brechin. Several visits were made in order to secure the interior of the car from the elements, owing to several missing windows. An initial survey indicated that the vehicle would not require as much work as was originally thought, as a result of its forlorn looking state. Some body work has been undertaken on the unit since preservation, which should speed up the restoration process. It was in use as a sandite car, and subsequently requires substantial internal restoration. 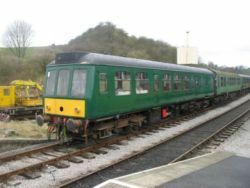 After a period at Bolton Abbey the vehicle has now moved to the Tanat Valley Railway where it is hoped a full restoration can be undertaken.